My girlfriend Lynn Axelrod owns a cottage in the woods near Forestville, and her tenant of two and a half years just moved out. As a result, she and I have been making repeated trips to her cottage during the past few weeks in order to get the property ready to be rented out again. The cottage is completely ringed by tall redwoods, and I spent most of one day with a rake and pressure washer merely removing all the redwood needles that had accumulated on the roof. A Western Pond Turtle sunning himself Tuesday at a pond next to Anastacio and Sue Gonzalez’s home in Point Reyes Station. Last Friday, Lynn and I were on the Freestone-Valley Ford Road driving back to Point Reyes Station from Forestville when I spotted a Western Pond Turtle walking along the edge of the northbound lane. So I turned the car around and drove back to the turtle. Lynn got out, picked it up, and carried it to a rancher’s driveway where I had had room to pull off the road and park. For a couple of minutes, we looked around trying to find a creek or pond where the turtle would be safe from traffic. Eventually we noticed a small pond beside the rancher’s long driveway. I could see the rancher standing outside his house, so I went through his gate and started up the driveway, and he walked down to meet me. “That turtle must be trying to commit suicide,” replied the rancher. “You’re the fourth people to rescue him this week.” He gave us permission to put the turtle in the pond. All this raises the question: why did that turtle persist in trying to walk along the edge of the pavement? Adult males have a larger home range (up to 2.4 acres) than females have (0.62 acres), so perhaps it was a male moving between wetlands. Earlier this month, a Marin Municipal Water District aquatic biologist reported finding that an adult male pond turtle, which he had previously marked, had traveled from Phoenix Lake in Ross to Papermill Creek in Point Reyes Station. The 18-mile journey took two years and would have required the turtle to climb some steep hills and get around a number of dams. Nonetheless, the turtle we found may well have been a female. 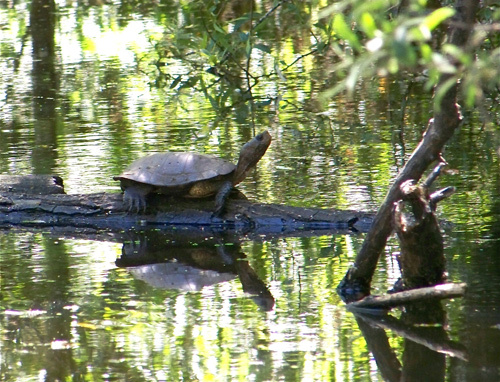 June is the peak of the nesting season for northwestern pond turtles (the subspecies we have around here), and northwestern females have been known to crawl as far as 1.2 miles along a waterway to find a suitable nesting site. 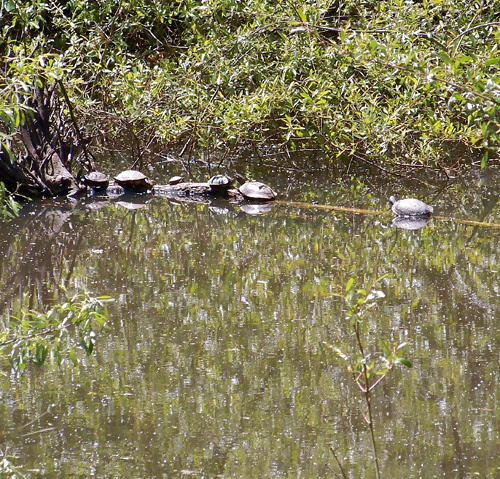 Basking western pond turtles, such as these at the Gonzalezes’ pond in May 2010, can be aggressive in making sure they have enough room. Usually this consists of biting and ramming other turtles to push them off their perch. Luckily, such aggression is usually over by noon, which leaves the afternoon free for sunning. Or so I read. Well, if they’d just stop walking in the road…. haha!! love this!! I can’t believe that the journey took 2 years!! Odds are the turtle in question was a female heading upland to nest. It’s great that you stopped to help her out, but in the future it’s always a good practice to move a turtle in the direction they’re facing – in this case, across the road (as counterintuitive as that may at first seem) – since she was no doubt leaving the water to nest. Turtles often exhibit high nest fidelity, which means she most likely has a nest site in mind, and nothing (short of a truck tire) will keep her from making the trek across the road in search of a nest site. If you are interested, you can visit http://bioaccumulation.wordpress.com/the-western-pond-turtle/educational-material/ where I’ve posted an educational brochure on what to do to help western pond turtles, including a page on what to do when you find a western pond turtle on the roadside. Sparsely Sage and Timely is powered by	WordPress 4.9.10 and delivered to you in 0.402 seconds using 54 queries.